Whether your party is pulling of the heist of a lifetime or attempting to investigating rumours that a lord is not what he seems, no Game Master wants to spend time drawing every back staircase and parlour. Fortunately, with Paizo's latest Pathfinder Flip-Mat, you don't have to! This line of gaming maps provides ready-to-use and detailed fantasy set pieces for the busy Game Master. Full of beautiful details, including a courtyard fish pond and imposing ancestral statues, this double-sided map makes the perfect setting for forays into the lives and secrets of the upper crust! Don't waste your time sketching when you could be playing. 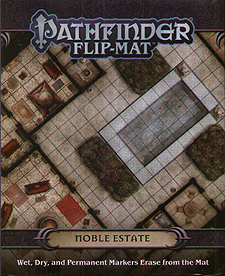 With Pathfinder Flip-Mat: Noble Estate, you'll be ready next time your players gain an audience with the peerage!